A retired U.S. Navy captain in Hawaii has been indicted on federal charges of receiving at least $145,000 in bribes from a Malaysian defense contractor. Leonard Francis, a contractor nicknamed “Fat Leonard,” pleaded guilty in 2015 to bribery and fraud charges in a decadelong conspiracy to overbill the U.S. Navy for fuel, food and other services that his company provided to ships in Southeast Asia. Haas used his influence to steer ships to ports controlled by Francis’ company and otherwise advance Francis’ interests, according to the indictment Aug. 16. Russia’s defense minister says the military forces in the country’s east have been put on high alert in the run-up to massive war games that also involve China and Mongolia. Sergei Shoigu said the five-day drills that began Aug. 20 will pave the way for the Vostok (East) 2018 military exercise. Shoigu said those maneuvers, set for next month, will be the largest since the massive Soviet war games in 1981. Shoigu said army, air force and navy units will take part in the exercise that will be held across the Far East and Siberia. He added that military units from China and Mongolia will also take part. The U.S. Air Force is planning a $150 million project to extend the runway at Joint Base Elmendorf-Richardson, Alaska, so it can to reduce airspace congestion and ease jet noise over neighborhoods. 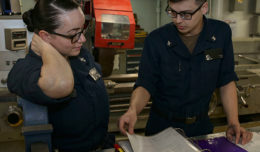 The Air Force plans to extend the north-south runway by 2,500 feet to the north, making that strip the main arrival runway, the Anchorage Daily News reported Aug. 18. The base’s current main arrival is the east-west runway, with its approach passing through crowded Anchorage airspace. 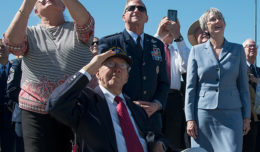 The project is expected to save the military up to $28 million each year in fuel expenses because the extended runway will allow planes to take more direct routes to and from range areas, he said. Residents of the Mountain View neighborhood south of the base have urged the Air Force to extend the runway. They have complained that air traffic noise has caused disruptions and some cited concerns the noise could hamper the neighborhood’s economic revitalization efforts. The project involves moving large amounts of earth and disturbing about 28 acres (11 hectares) of wetlands, according to the environmental analysis. Officials will work with the Army Corps of Engineers and the Environmental Protection Agency to mitigate the loss of wetlands, said Keisha K. Lafayette, an Air Force public affairs specialist. Russia and Egypt have discussed ways to expand their military ties and boost anti-terrorism cooperation. Russian Defense Minister Sergei Shoigu said during talks Aug. 20 with his Egyptian counterpart, Mohamed Zaki, that Moscow strongly supports Egypt’s efforts to combat militants in the Sinai Peninsula. Shoigu said the Russian military is ready to share the experience of its military campaign in Syria with Egypt. Zaki noted that Moscow and Cairo have a shared view of current security challenges. A Swedish jet fighter has crashed in southern Sweden, apparently after striking a bird. Sweden’s Armed Forces said Aug. 21 that the pilot of the Swedish-built JAS 39 Gripen fighter jet ejected safely after the bird strike. He has been taken to a nearby hospital, likely for checks. The plane crashed near Karlskrona — 99 miles east of Malmo, Sweden’s third largest city.